Color: all colours are available for zerbera flower. We offer the best quality Perennial Flowers at the most reasonable prices. 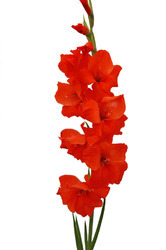 These flowers are available in different colors and varieties. These flowers are not seasonal and blossom all year round. These flowers are available in planters as well as without them. These flowers are priced economically and are easy to maintain. We offer freshly cut gerbera flower, which is very popular and widely used decorative flower. With us, customers can order variety of gerbera flower in different colors having different shapes and sizes of the flower. The most popular colors of our these fresh flowers are yellow, orange, white, pink, red and the most exclusive black. Banking on our enriched industry experience, we are able to supply Daisies Flowers. Cucumber mosaic virus, which we detect often in gladiolus samples, causes white break mosaic. This disease can cause flowers to be blotchy and open slowly. Cucumber mosaic virus is spread by aphids. Davar Farms and Nursery have an assortment of seasonal flowers for both the summer and the winter season. We also have an assorment of perinnial indoor ornamental plants for your homes and offices!